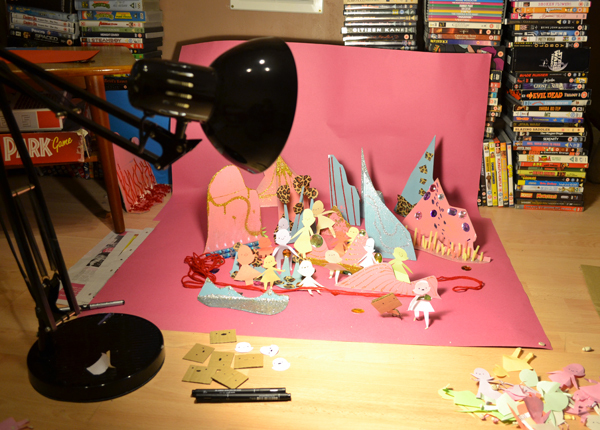 I thought I’d post some photos from when I was making the We’re Out comics. If you were interested to know how it was made, these might provide a bit of an insight. Before I even finished writing the story, I took a lot of test photos and put together a few test comics to make sure I could actually do a comic with 3D models. Here’s one of the test comics. The techniques I figured out at this test stage were the same ones I used for the whole story, but in the final comics I made the panels less crazily angled. I took this test photo at my mum’s house. For a while I thought I might photograph all the inside-the-house scenes at my mum’s house because it’s a lot nicer than mine! But then I decided not to be a faker. 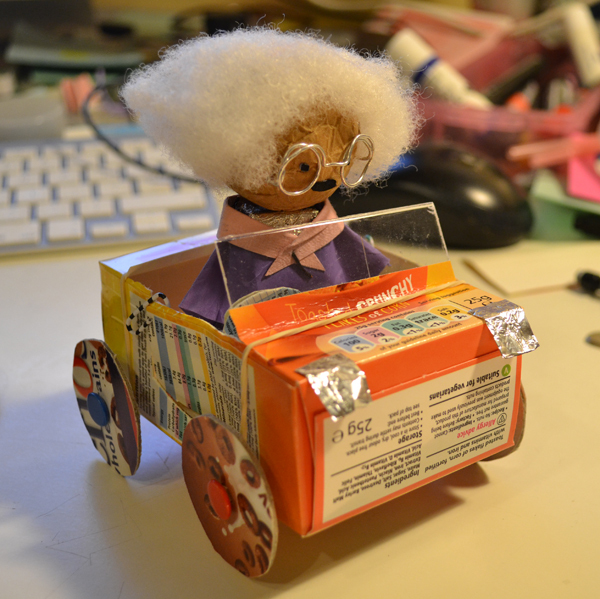 This is the 3D Nanny model and the car. I made the 3D version of Nanny before I designed the 2D version. Here’s a pile of Colins and Paulines. The Colin model has got black wire for arms, legs and a neck. These are sandwiched between pieces of cardboard. For each new expression I had a new Colin head which was stuck on with blu-tac. I made 5 different Colin bodies throughout the whole story because they got damaged after being bent around so much. For Pauline I made a poseable model by sticking a layer of thick tin foil between two paper bodies. 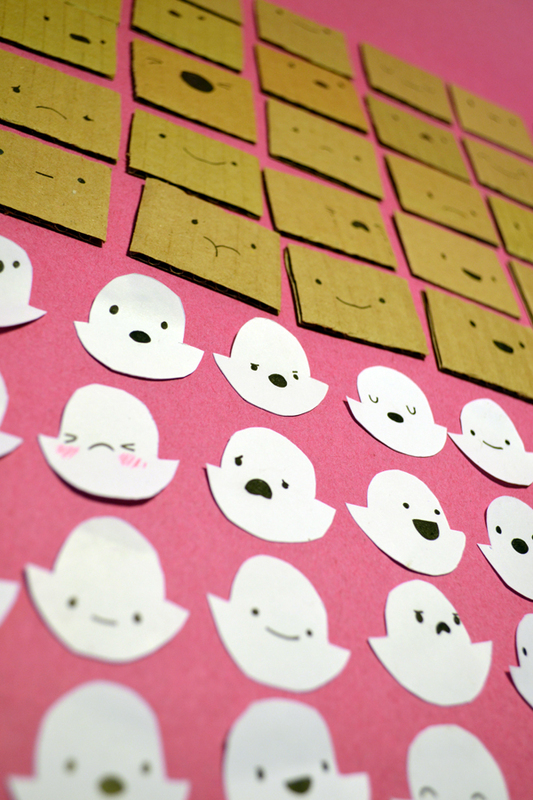 I used new paper heads for each expression. For certain scenes and poses I cut out entire new bodies. Here’s a selection of the removable heads. All together there were a lot more. Some of them are still lying around in various corners of my house. 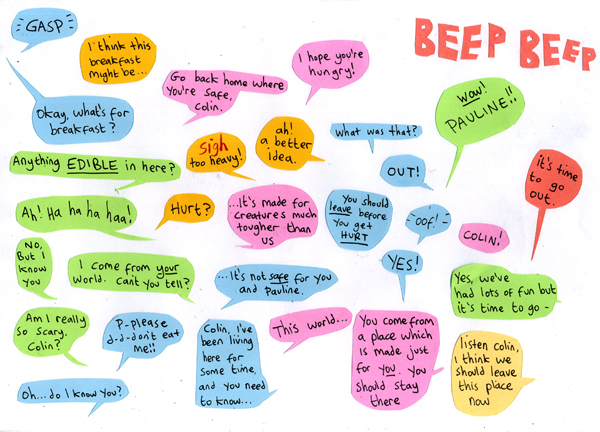 Here’s a page of speech bubbles. I would take the photographs for each comic page and then do the speech bubbles after. 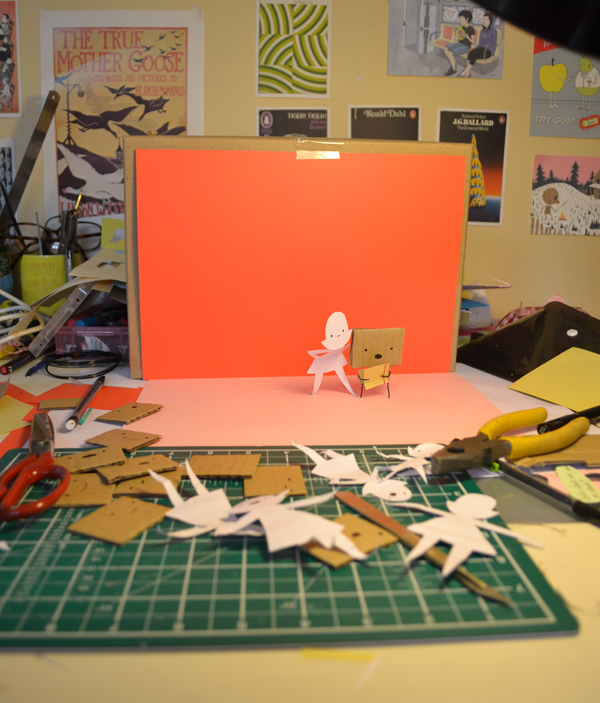 The “set” for the 3D version of “my cardboard life world”. Colin’s feet are actually going through the paper at the bottom and into blobs of blu-tac. Me in the graveyard taking photos of the car. The set for the glittery world that the army of Paulines built. It’s mostly spray-painted pieces of cardboard and lots of glitter. This set is the last panel with the flying Nanny. 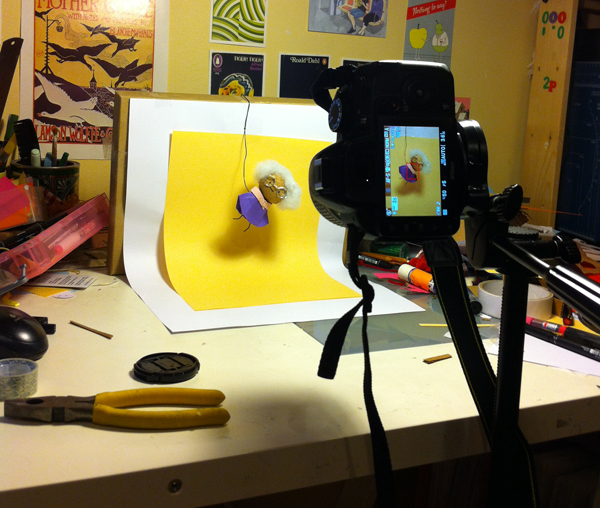 I took several photos, turning the camera slightly each time to make the 3D animated gif. And here’s one last photo of Colin and Pauline having coffee and a croissant with me after a long morning of taking photos around Nottingham. I went out very early so it it wouldn’t be too busy and I wouldn’t get in peoples’ way. (That’s Luke in the background. 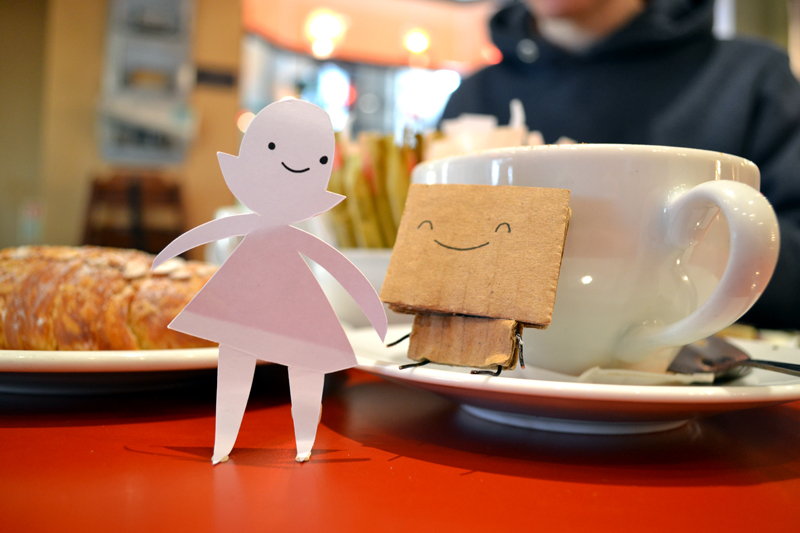 He came with me when I was taking photos around town. I think I would have been too nervous to do it if he hadn’t been there!). I hope that was interesting! It’s back to normal 2D comics for me now. Starting from Monday (24th June) I’ll be doing 5 updates a week. Hopefully I can keep that going for a few months but I’ll probably go back to 3 a week in the Autumn. That was so great, thank you for sharing all of these process pictures!! I’m glad Colin and Pauline got the chance to socialise with you while they were in the 3D world. Wow, that’s really cool. 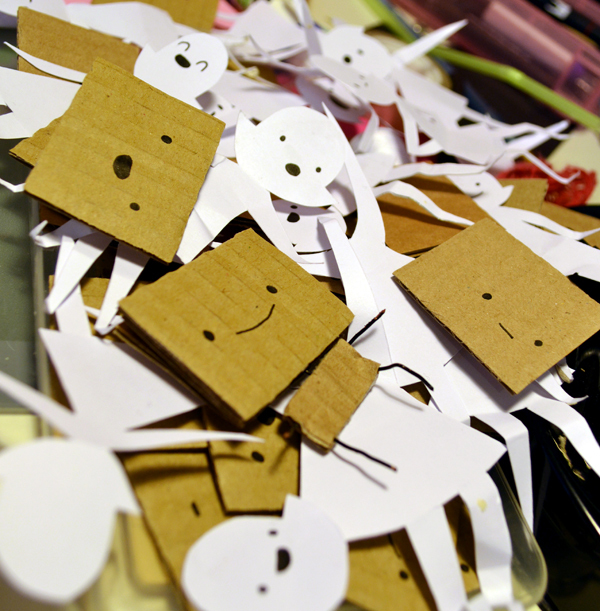 Looking at the faces and bodies for all of them, it reminds me of Coraline or ParaNorman. 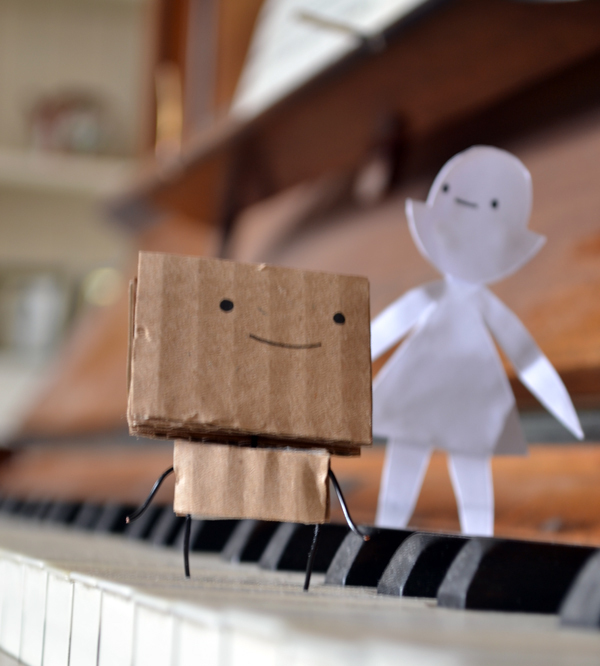 Have you ever considered doing a stop-motion film with these two? Even if it’s just for fun, I bet it could happen! Thanks for sharing the behind-the-scenes info! I love seeing how-to stuff like that, even though I have no intention of trying anything that ambitious in my own comics! These are so wonderful!!! Thank you for sharing all the hard work that goes into each piece! Thank you so much for this. Glad we voted for this one too, that was awesome. Gosh, you kill me. I’ve been subscribed to MCL forever via RSS, and only recently realized you do those adorable Soppy comics– and then, like, the knitting. and the puppets. and THIS. what are you? its too much! Absolutely fantastic! I love Colin and really enjoyed this story! On the candlelit photo which says “Except it smells like green apple and cinnamon”, how did you do the red “aroma” tints? Were they drawn onto the photo after, they cut out of cellophane, or did you do something more clever than I can imagine? It looks to me as if she might have pasted cellophane onto the photo afterward. Just a guess. The fifth picture (with all the faces) looks like a Warhol print – freaky, yet cool. 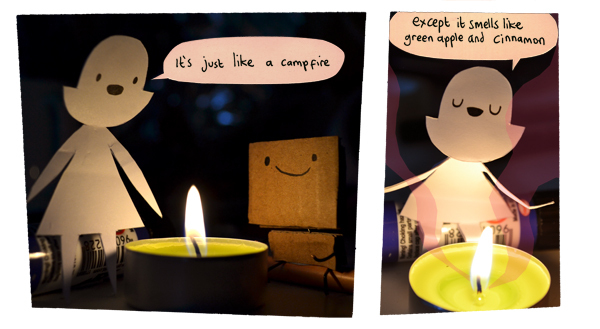 those first two panels – the campfire ones – are my favorites, of anything i’ve seen from We’re Out. i wish you’d’ve put them in the actual comic! The detail in your work is amazing, what DSLR is that you are using? I assume it has an expensive light sensor!